Phong Nha - Ke Bang is a national park in the center of Quang Binh province in north-central Vietnam. It protects one of the world's two largest karst regions with several hundred caves and grottoes. 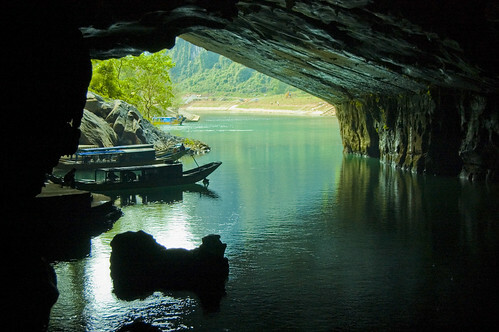 Its name derives fr0m Phong Nha cave, the most beautiful one, with numerous fascinating rock formations, and Ke Bang forest. The plateau is probably one of the finest and most distinctive examples of a complex karst landform in Southeast Asia. The western boundary of the Park partially forms Laos-Vietnamese border, which is only 42km fr0m the sea. The Park is found within the geographical co-ordinates of 170 20'-170 48' N and 1050 46-1060 24' E in Bo Trach and Minh Hoa Districts. It was recognized as a world natural heritage site at the UNESCO's 27th general assembly session being held in Paris in June 30th – July 5th, 2003. At the session, delegates fr0m over 160 member countries of UNESCO World Heritage Convention agreed to include Phong Nha-Ke Bang park and 30 others worldwide in the list of world heritage sites. Phong Nha-Ke Bang National Park meets with criteria viiii in accordance with UNESCO’s appraisal scale since it displays an impressive amount of evidence of earth’s history and is a site of importance for increasing human understanding of the geologic, geomorphic and geo-chronological history of the region. Looking into the caves, you may recognize discrete episodic sequences of events, leaving behind various levels of fossil passages, formerly buried and now uncovered palaeokarst (karst fr0m previous, perhaps very ancient, periods of solution); evidence of major changes in the routes of underground rivers; changes in the solutional regime; deposition and later re-solution of giant speleothems and unusual features such as sub-aerial stromatolites. The location and form of the caves suggest that they might owe much of their size and morphology to some as yet undetermined implications of the schists and granites which overlay the limestone. On the surface, there is a striking series of landscapes, ranging fr0m deeply dissected ranges and plateaux to an immense polje. There is evidence of at least one period of hydrothermal activity in the evolution of this ancient mature karst system. The plateau is probably one of the finest and most distinctive examples of a complex karst landform in SE Asia. The oldest evidence of human occupation of the area are Neolithic axe heads and similar artefacts found in some of the caves. There are some relics of Ham Nghi King, a final King of the Nguyen dynasty before the French colonial period, at the Maria Mountain in the north of the Park. Currently the Arem, Ma Coong and Ruc ethnic groups live in two villages in the core zone of Phong Nha Ke - Bang National Park. Until 1962 these indigenous people lived in the forest in houses made of bamboo and leaves or in the caves, living fr0m forest products and hunting. They used simple tools and their clothes were made fr0m the bark of a toxic forest tree (Antiaris toxicaria) and lianas. Since 1992 the Government of Vietnam has set up two new settlements for these 475 people, who are the two smallest ethnic groups in Vietnam. These people are familiar with a number of economically valuable species, especially precious timber such as Mun and Hue (Diospyros spp., Dalbergia rimosa), and oil-extraction fr0m species such as Tau (Hopea hainanensis) and many medicinal plants. The Phong Nha Cave has long been a site of religious and touristic importance, with an old Cham Temple discovered in the cave and it was a site of worship in the ninth and tenth centuries. During the war with the USA the Phong Nha - Ke Bang forest and caves were a garrison and weapons store for the Vietnamese army.